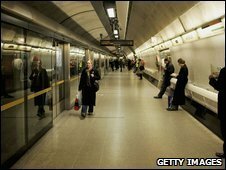 London Mayor Boris Johnson has said the government should pay for a potential £400m shortfall for upgrading the Tube. The upgrade work is funded by a public-private partnership (PPP) plan. PPP arbiter Chris Bolt said in a draft ruling that maintenance company Tube Lines' costs for seven-and-a-half years from July 2010 should be £4.4bn. This is less than the £5.75bn Tube Lines says it needs, but more than the £4bn London Underground said the work should cost. Mr Johnson said any additional costs to LU over and above the £4bn "should be met by government who imposed the PPP structure on London". But the Department for Transport said it was up to LU and Tube Lines to agree a fair price for the work. Mr Johnson has been furious that Tube Lines' upgrade of the Jubilee line has not been completed on time, leading to frequent weekend shutdowns and part closures of the line. He has told the House of Commons Transport Committee the problem "went to the heart" of what was wrong with PPP and said in August, when it was announced the closures would last into 2010, that "Tube Lines must get its act together - I am hugely frustrated at their progress to date." Tube Lines was one of two private maintenance companies charged with upgrading the network under 30-year contracts within the PPP agreement. The other company - Metronet - collapsed in 2007 and its work was taken over by TfL, with Tube Lines carrying on its responsibility for the Jubilee, Northern and Piccadilly lines. In his draft directions and guidance, Mr Bolt said Tube Lines could have delivered the Jubilee line upgrade on time and to budget and could now have been progressing well with the upgrade of the Northern Line. On costs, he said an efficient company could deliver its obligations at "a substantially lower cost than projected by Tube Lines, though not as cheaply as suggested by LU". Mr Johnson said: "I welcome the arbiter's rejection of Tube Lines' view of costs, and his recognition that they should be much closer to LU's. "However, I am determined that any additional costs must not fall on London's fare-payers and taxpayers." A Department for Transport spokesman said: "It is for LU and Tube Lines to agree a fair price and scope which deliver value for money for the tax and fare payer and within the their funding settlement." Dean Finch, Tube Lines chief executive, said: "A settlement at this level is not conducive to private sector involvement in the Underground, nor does it reflect the reality of the Underground working environment." He added: "The Arbiter has acknowledged even at this level that LU has a stark choice to make - either to do less work or raise additional finance." Jo deBank, communications officer of passenger watchdog London TravelWatch, said: "It is too early to tell how this will affect passengers directly. "However, we do not want to see fares rising to plug any funding gap, and they should not suffer any worsening of services." Mr Bolt said he would make his final decisions on charges in spring.